As an academic researcher, it can be easy to get caught up in the politics, numbers and deadlines that make up a typical academic setting. In doing so, there is the ongoing danger of forgetting to make the results of northern research relevant to the general public. Funding programs that incorporate academic community visits and local science out-reach organizations are two approaches that facilitate the translation of research results from academic jargon to plain language. When a graduate student applies for funding at the federal (NSERC/SSHRC) and local levels (Association of Canadian Universities for Northern Studies), there is an expectation of community interaction. It is an important component to any research plan, allowing each student a unique opportunity to interact with the local community. Some may wonder about the applicability of this requirement to their project when working in an isolated region. However, community interaction at any level works to bolster the reputation of research groups and the trustworthiness of their results. Any chance a researcher has to make his or her work publicly accessible and understandable contributes to this endeavor. Federal programs have contributed to this mission in the past, such as the Northern Research Internship Program, which provided funding to graduate students so they could work in the North for up to six months. Funding for this particular program has since been re-budgeted elsewhere, but the spirit behind the program needs to be carried forward by the next generation of academic researchers. Luckily, local organizations subscribe to this same spirit and work to improve public education in their communities. In the Yukon, there are several examples of organizations working towards this goal. The Yukon Geological Survey’s Outreach Geologist, Sarah Laxton, continues to introduce all levels of elementary and secondary school students to the science behind geomorphology, geology and water. Laxton helps community schools in the Yukon maintain a frost tube network that contributes to a dataset compiled by the Institute of Northern Engineering at the University of Alaska, Fairbanks. The Yukon Research Center (YRC), at Yukon College, has two programs that rely heavily on community involvement. Science Adventures is the public outreach branch of the YRC, which mostly focuses on elementary and secondary school students. They are the main sponsors of the Yukon/Stikine Regional Science Fair, often recruiting local scientists and teachers as judges for the fair, as well as the All Girls Science Club. While the topics are relatively general in nature, the All Girls Science Club provides a platform for scientists to showcase how their research relates to the larger body of scientific knowledge. Additionally, the Northern Climate Exchange, a research branch of the YRC and partner in a landscape hazards community mapping project, aims to aggregate various types of geoscience research into community planning tools. While these programs continue to garner community recognition, they are by no means the only in operation. 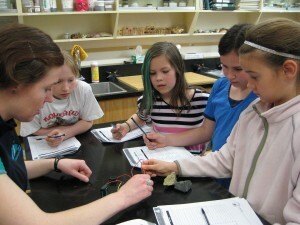 All Girls Science Club in action! From left to right: Sarah Laxton (Yukon Geological Survey), Kelda Lewis, Jasmine Sealy, Helene Maguire, Milena Stad. (Photo by Sam Darling; used with permission). 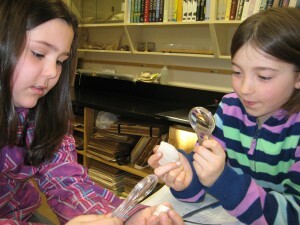 Magnifying their options with the All Girls Science Club: Belit Peters (left) and Remie Cherepak (right), (Photo by Sam Darling; used with permission). APECS, Communication, Education, and Outreach, Guest Authors, Policy and Politics APECS, Arctic, Canadian science, polar week, science communication, science outreach, science policy, Yukon. permalink.